Ysiad with Kombucha Baby in his left hand. 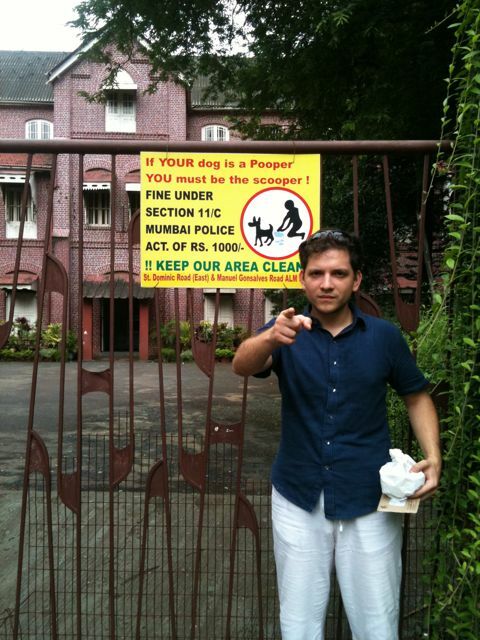 One of our favorite doggie Hinglish signs is behind him. Yesterday we got a kombucha culture, so Daya and I are going to start making our own Kombucha. On Tuesday, I emailed someone off a website about kombucha. Wednesday morning, she emailed me back. She said she lived about two hours outside of Bandra, but coincidentally, she happened to be attending a meditation workshop in Bandra on Saturday, and we could meet her there if we wanted to pick up a culture. Thursday, we spoke on the phone to discuss the details. Yesterday, Saturday, we met her in St. Andrew’s College in Bandra where she gave us a kombucha culture and some instructions on how to care for it for free. She was a nice woman at least eighty years old who got around fine and spoke perfect English. She told us about how she’d recently been to the states. Some of her fellow meditation-mates showed up while we were talking, so we left the classroom and invited her to our place one of these Saturdays after meditation. I am in search of Kombucha baby culture. I am in chennai. Can you help me out in getting Kombucha? I am searching for Kombucha culture myself. could you please help me? Perhaps a baby culture from your stock or the contact details of the Kombucha lady.